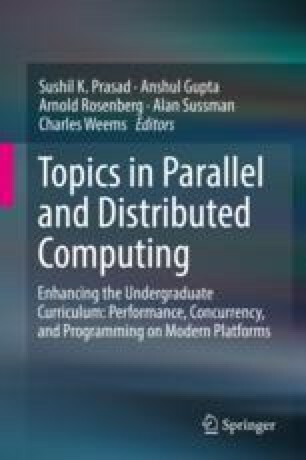 In this chapter, we explore various parallel and distributed computing topics from a user-centric software engineering perspective. Specifically, in the context of mobile application development, we study the basic building blocks of interactive applications in the form of events, timers, and asynchronous activities, along with related software modeling, architecture, and design topics. We are grateful to our former graduate students Michael Dotson and Audrey Redovan for having contributed their countdown timer implementation, and to our colleague Dr. Robert Yacobellis for providing feedback on this chapter and trying these ideas in the classroom. We are also grateful to the anonymous CDER reviewers for their helpful suggestions. Kevin Ashton. That ’Internet of Things’ thing. RFID Journal, http://www.rfidjournal.com/articles/view?4986, July 2009. Accessed: 2016-12-09. Google Webmaster Central Blog. Rolling out the mobile-friendly update. https://webmasters.googleblog.com/2015/04/rolling-out-mobile-friendly-update.html, April 2015. Accessed: 2016-12-12. Stefano Borini. Understanding model-view-controller. https://www.gitbook.com/book/stefanoborini/modelviewcontroller, 2016. Accessed: 2016-12-09. Jemma Brackebush. How mobile is overtaking desktop for global media consumption, in 5 charts. Digiday, http://digiday.com/publishers/mobile-overtaking-desktops-around-world-5-charts/, June 2016. Accessed: 2016-12-10. Google. Android developer reference. http://developer.android.com/develop/, 2009–2018. Accessed: 2016-12-09. Google. Memory consistency properties. https://developer.android.com/reference/java/util/concurrent/package-summary.html#MemoryVisibility, 2009–2018. Accessed: 2016-12-09. Google. Processes and threads. http://developer.android.com/guide/components/processes-and-threads.html, 2009–2018. Accessed: 2016-12-09. Google. SMP primer for Android. http://developer.android.com/training/articles/smp.html, 2009–2018. Accessed: 2016-12-09. Google. Android Studio: Use Java 8 language features. https://developer.android.com/studio/write/java8-support.html#supported_features, 2017. Accessed: 2018-02-05. The Guardian. Mobile web browsing overtakes desktop for the first time. https://www.theguardian.com/technology/2016/nov/02/mobile-web-browsing-desktop-smartphones-tablets/, November 2016. Accessed: 2016-12-10. Konstantin Läufer, George K. Thiruvathukal, and Robert H. Yacobellis. Loyola University Chicago Computer Science COMP 313/413 course examples. https://github.com/lucoodevcourse/, 2012–2018. Konstantin Läufer, George K. Thiruvathukal, and Robert H. Yacobellis. Loyola University Chicago Computer Science COMP 313/413 course examples: Click counter. https://github.com/lucoodevcourse/clickcounter-android-java, 2012–2018. Konstantin Läufer, George K. Thiruvathukal, and Robert H. Yacobellis. Loyola University Chicago Computer Science COMP 313/413 course examples: Prime number checker. https://github.com/lucoodevcourse/primenumbers-android-java, 2012–2018. Konstantin Läufer, George K. Thiruvathukal, and Robert H. Yacobellis. Loyola University Chicago Computer Science COMP 313/413 course examples: Simple threads. https://github.com/lucoodevcourse/simplethreads-java, 2012–2018. Konstantin Läufer, George K. Thiruvathukal, and Robert H. Yacobellis. Loyola University Chicago Computer Science COMP 313/413 course examples: Stopwatch. https://github.com/lucoodevcourse/stopwatch-android-java, 2012–2018. Oracle. Java platform, standard ed. 8 API specification: Class EventQueue. http://docs.oracle.com/javase/8/docs/api/java/awt/EventQueue.html, 1993–2018. Accessed: 2016-12-09.